滕浩, 薛一雪, 王萍, 刘云会. miR-194对人脑胶质瘤U87细胞恶性生物学行为的影响[J]. 中国医科大学学报, 2018, 47(8): 673-677. TENG Hao, XUE Yixue, WANG PING, LIU Yunhui. Effects of miR-194 on the Malignant Biological Behavior of Human Glioma U87 Cells[J]. Journal of China Medical University, 2018, 47(8): 673-677. Abstract: Objective To investigate the expression of miR-194 in human glioma tissues and human U87 cells and to study the effect of miR-194 on the proliferation, migration, invasion, and apoptosis rate of U87 cells. Methods Real-time PCR was used to detect the expression of miR-194 in 23 samples of glioma tissue and 5 samples of control brain tissue (cerebral hemorrhage and traumatic brain tissues). Agomir-194, antagomir-194, and their negative control were transiently transfected into U87 cells. The CCK-8 assay was used to detect the change in proliferative activity of the U87 cells. The Transwell assay was used to detect changes in migration and invasion ability. Flow cytometry was used to detect any changes in cell apoptosis rate after transfection of miR-194. Results Compared with the control group, the expression of miR-194 was significantly down regulated in glioma tissues(P < 0.05). 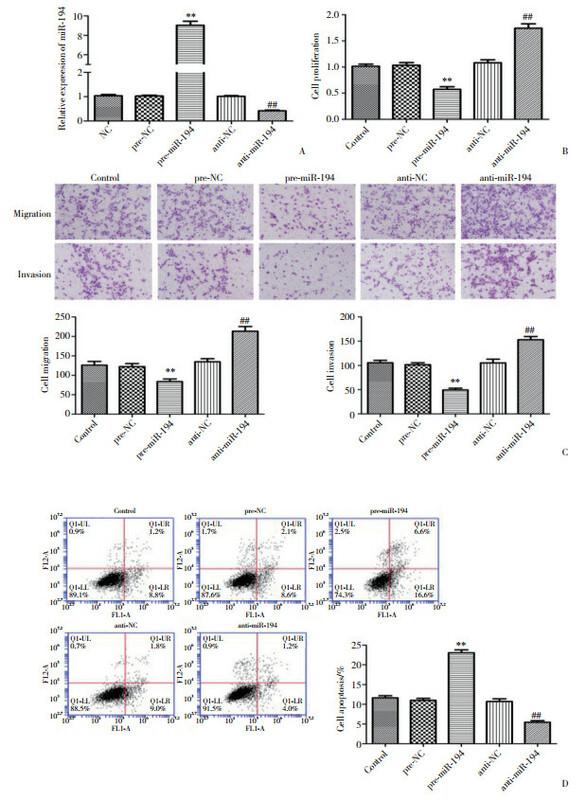 Overexpression of miR-194 significantly inhibited the proliferation, migration, and invasion of U87 cells and significantly promoted the apoptosis of U87 cells. Conclusion miR-194 was down regulated in glioma tissues and U87 cells. Overexpression of miR-194 can significantly inhibit the proliferation, migration, and invasion of U87 cells and promote cell apoptosis. BAO J, ZOU JH, LI CY, et al. miR-194 inhibits gastric cancer cell proliferation and tumorigenesis by targeting KDM5B[J]. Eur Rev Med Pharmacol Sci, 2016, 20(21): 4487-4493.